Next up was Ronald Pies, who addressed the audience on the relationship among Stoicism, Judaism, and Buddhism. He began with a brief discussion of possible historical influences of these philosophies on each other, for instance via the alleged indirect connection provided by the travels in India of the Skeptic Pyrrho, as a member of Alexander the Great’s retinue. (See this controversial book for more.) The meat of the talk, to which I cannot possibly do justice here, was a list of eight common features shared by the three philosophies, on topics that included tact, empathy, and compassion; joyfulness, gratitude, and pleasure; cosmology and temporality; the afterlife; and free will and determinism. I hope the Modern Stoicism site will soon publish the full account of Ronald’s presentation. Unfortunately, I do not have notes on the talk by Sharon Lebell, entitled “Living the Best Possible Life: Epictetus’ Rx for Clarity, Ease, and Serenity.” That is simply because my “notes” from the event are in the form of photos of slides (I was the unofficial Twitter of the event), and Sharon’s presentation was entirely in the oral tradition. Check out her book, though, The Art of Living: The Classical Manual on Virtue, Happiness, and Effectiveness. The next to the last morning talk was delivered by Walter Matweychuk (an alumnus of the Stoic Camp New York I co-run with my friend Greg Lopez), on Rational Emotive Behavior Therapy in the words of Epictetus. Walter highlighted the fact that REBT borrowed heavily from Stoicism, and that its founder, Albert Ellis, always said that his therapy was an amalgam of ancient and modern philosophy. He then set out some characteristics of unhealthy emotions: they are essentially self-defeating, interfere with living well with what one cannot change, undermine our efforts to improve things, may lead to excessive (e.g., aggressive) behaviors, often trigger avoidance or escape behavior (such as the use of alcohol), and prevent us from experiencing some degree of happiness in the face of adversity we cannot avoid. Walter argued that REBT is both a philosophy and a therapy, a position with which I disagree. I do acknowledge the strong philosophical bases of rational emotive behavior therapy, but a therapy is usually meant to address specific issues (e.g., phobias, depression) and only be remedial. A philosophy, by contrast, doesn’t do as well in those situations, but provides us with a compass, or a general framework, for an entire life. The two approaches, then, are complementary (as I argued here), and I am a bit skeptical of all-in-one packages. The last talk was one of my favorite, by William Stephens, on phobias, terrorism, and Stoic fearlessness. A significant message from William’s presentation was that the Stoics were absolutely right that we should question our “impressions” before assenting to them, as we often have highly distorted perceptions of reality, which can lead to disastrous actions. 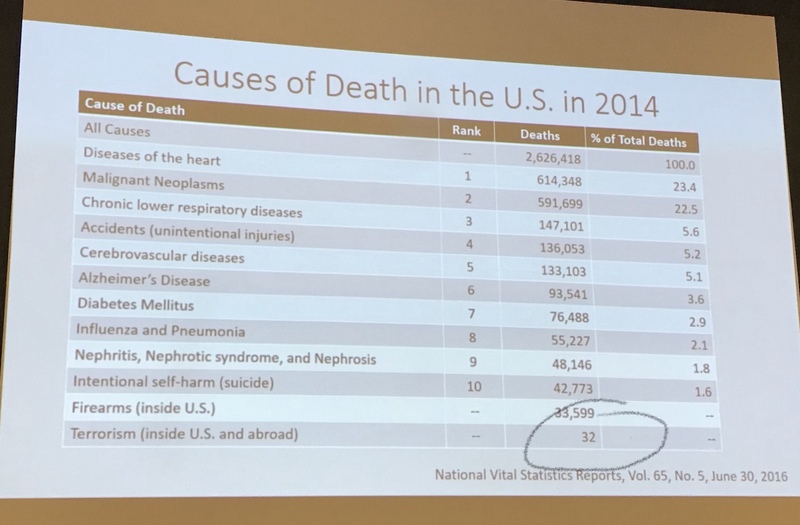 Just look at the following slide from his talk, for instance, and see for your self if you should really be worried about terrorism, or if the US should be spending billions in anti-terrorism measures and not, say, on the prevention and cure of heart disease. A similar slide compared the number of deaths from terrorism to those due to gun violence in the US, from 2001 to 2014. The two lines are essentially flat (i.e., they show little change over time, though deaths by gun violence have actually increased slightly). Therefore, the latest figures for the year 2014 are representative: they stand, respectively, at 32 and 33,599. Again, which one should we worry about, or take serious action to correct? Indeed, as Margaret reminded us, the Stoic Sage will experience the three broad categories of positive emotions (eupatheiai): joy (enjoyment, cheerfulness, good spirits), wish (good intent, welcoming, cherishing, love), caution (moral shame, reverence). But his life will be free of the unhealthy passions (pathos), such as fear, anger and hatred. Now that is something to strive for. This entry was posted in STOICON & Stoic Week on November 17, 2017 by Massimo. Regarding Dr. Chakrapani’s vision on God (inspired by Stoic ideas), it is very similar to what a Greek Stoic philosopher used to say, as it was registered by Pliny the Elder: deus est mortali iuvare mortalem. The translation would be something like ‘God is/consists in a mortal helping another mortal’ or even ‘To help man is man’s God’. Many thanks for the nice summary of the conference talks, Massimo, and for the call-out to my own contribution (which was essentially a drastic condensation of my book, The Three-Petalled Rose). I also want to commend you on your own very lively, engaging and thought-provoking talk. It was a pleasure meeting you, albeit briefly! 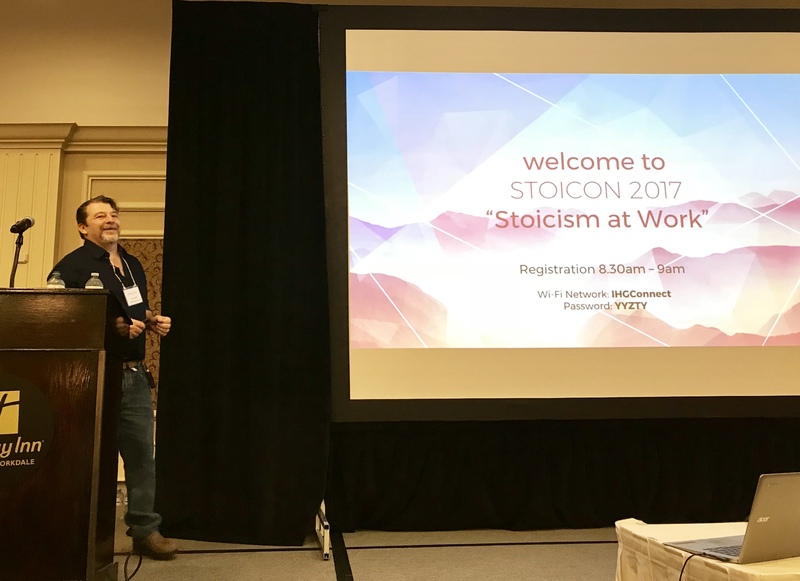 Will videos of the Stoicon 2017 presentations become available at some point? Yes, videos will be available, check with the Modern Stoicism site from time to time. They were some excellent talks! A full summary of Massimo’s talk will be coming out in Stoicism Today next Saturday. I’ve seen the video of Greg’s breakout session, and it is terrific. Well worth watching! i fail to see a connection between Judaism and stoicism. this has nothing to do with individual jewish people in 2017, but i have read leviticus and deuteronomy and i see little “empathy and compassion” in them. i take these scriptures seriously and there is nothing remotely stoic there. and these are the cornerstones of the faith. the buddha speaking about the origin of suffering makes sense from a stoic viewpoint, an irrational “jealous” god makes none at all…..
Hi, Mr. Rustyak–Thanks for your comment, which presents an opportunity to make an important distinction: that between “Biblical” Judaism and the much later development of Talmudic/rabbinic Judaism. When we consider the Hebrew Bible (which non-Jewish scholars often call “The Old Testament”), we do indeed find a rather non-Stoic deity (variously named “Elohim”, “Yahweh”, etc.). The Biblical literature probably developed as early as 1000-700 BCE–nearly a millennium before the Talmudic period in which rabbinical Judaism developed (ca. 70 CE-500 CE). The Hebrew God of the scriptures was initially a kind of “god of War”, who gradually developed into “God the Law Giver” (e.g., with the Ten Commandments). But you are right that–with the possible exception of the “wisdom” books, such as Ecclesiastes and Job–there is little affinity between Stoicism and the Hebrew Bible. The Stoicism/Judaism connection develops around the time of Marcus Aurelius, when there is some evidence of interchange between the rabbis of the time and the Stoics, as I suggested in my talk. Much later, Maimonides (Moshe be Maimon, ca. 1135-1204 CE) developed a markedly “rationalistic” view of Judaism that also has strong affinities with the Stoics; e.g., “The more one is disciplined…when great misfortune and tribulations [come], one is neither startled nor terrified but tolerates them well.” (Essays on Health). It was also during the Talmudic period that the values of empathy, compassion, and kindness begin to emerge as core Judaic values. (By the way, there is nothing in the Talmud that speaks to being “a good Jew”; rather, the Talmud always alludes to being a “good person” or a “good human being”–what, in Yiddish, we would today call “a mensch”!). If you want to delve into these connections, I would be happy to send you the PDF of my book, “The Judaic Foundations of Cognitive-Behavioral Therapy.” For that, I would need an email address. Finally, I am happy that we agree on some connections between Buddhism and Stoicism. Very good roundup. I’m more favorable to at least some version of Cynicism than you are, Massimo, though not necessarily its full original version. It is interesting to see the interplay with Stoicism.